Edwin Althoff age 78, died Friday, June 5, 2015 at the Shady Rest Care Center, Cascade following an extended illness. 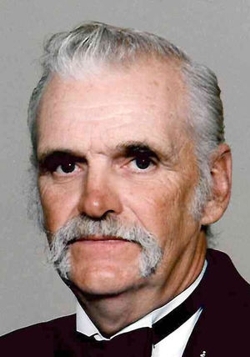 Funeral services were held at 10:30 Tuesday morning, June 9, 2015 at St. Patrick Catholic Church, Anamosa with interment at St. Joseph Cemetery, Prairieburg. Friends called from 2 until 8 Monday at the Goettsch Funeral Home, Anamosa where a parish Vigil Service was held at 2:00. Surviving are five sons, Daniel (Sue), Wyoming, Robert (Karen), Coggon, Donald (Jane) Onslow, Thomas (Jill Ary), Newhall, Ronald (Julie), Olin; seven grandchildren, Brianna, Joshua, Allison, Nicole, Caleb, Cameron and Noah; one great-grandson, Aidan; his brother, Charles (Geri) Cascade, two sisters, Geraldine (Frank) Kintzle, and Kathy Graham, both of Cedar Rapids. He was preceded in death by his parents, his wife Mary Ann in 1995, two sisters, Virginia Dzaboff, and Elaine Kirsch, and a brother Clarence. Edwin F. Althoff was born February 27, 1937at Cascade, Iowa. He was the son of Frank and Vivian (Laban) Althoff. Ed attended schools in Bernard, Cascade and Worthington. He served in the United States Army during the Korean War. He returned from service and worked at Wilson Foods in Cedar Rapids. He was employed there for twenty-nine years. Ed later worked at AsGrow Seed in Anamosa before retiring. Edwin Althoff and Mary Ann Jesenovec were married on January 19, 1963 at St. Paul’s in Worthington. The couple made their home in Anamosa since 1969. Mary Ann preceded him on death in April 25, 1995.